About 4-million years ago, the Waianae volcano started the formation of the island of Oʻahu. About 2.5-million years ago, the Koʻolau volcano erupted on the ocean floor, and continued to grow in elevation until about 1.7-million years ago. More than 30 separate eruptions flowed out over the eroded landscape and onto the fringing reef about half a million years ago with a series of volcanic vents opened along the southeast shoreline of O‘ahu forming now-identifiable features including Diamond Head, Punchbowl and Hanauma Bay. 1) Uma can refer to a curve, as in the natural geological formation of the crescent shape of the bay. 2) Another meaning refers to the sport of hand-wrestling, uma, where opponents knelt with elbows on the ground and right hands locked together and tried to force the other down. Hanauma Bay was known as a place where ali‘i would gather to play uma, as well as other recreational activities. 3) The stern of a canoe is also known by the term uma. Traditional Hawaiian navigators would ride a strong current across the Ka‘iwi Channel from Ilio Point on Moloka‘i to Hanauma Bay with relatively little effort. Thus, three suggested meanings for Hanauma Bay are: curved bay, hand-wrestling bay and canoe stern bay. In 1928, the City and County of Honolulu established Koko Head Regional Park – the land encompassing Koko Head, Hanauma Bay and Koko Crater – by purchasing it from Bishop Estate. A deed restriction limited its use to public parks and rights of way. In the 1930s the road along Hanauma Bay’s corner of Oahu was paved and a few other amenities provided that made it easier to visit the beach and reef. After closure during World War II, the Bay area reopened and became even more visitor friendly after blasting in the reef for a transoceanic cable provided room for swimming. In 1956, the City sold the Hawaiian Telephone Company an easement through the bay or the first leg of a new trans-Pacific undersea telephone cable. A 200-foot wide channel was blasted through Hanauma Bay for the installation of the first trans-Pacific telephone cable reaching from Hawaiʻi to California. Hanauma Bay became Hawaiʻi’s first Marine Life Conservation District (MLCD,) in 1967. Established to conserve and replenish marine resources, MLCDs provide fish and other marine life with a protected area in which they can grow and reproduce. While state laws restrict the taking of all marine life within the Hanauma Bay MLCD, snorkeling, diving, underwater photography and other similar passive activities are allowed. More changes in the 1970s by the City cleared more area in the reef for swimming, made an additional parking lot, and shipped in white sand from the North Shore, leaving Hanauma Bay increasingly more attractive for daytime use. By 1990 overuse of the beach and surrounding area was a real problem, with visitors walking on the reef, swarming the surrounding areas, and parking on the grass and on the sides of the road. A few years later, in 1998, an admission fee was charged, further reducing the number of visitors. The city charges non-residents (now $7.50 per person) to enter the bay; Hawaiʻi residents get in free. Parking costs $1. Then in August 2002, the Marine Education Center was opened at the entrance to the bay. Through a mandatory video and displays, all visitors to the park learn about reefs, the nature preserve and its rules, and how to protect the marine life. The UH Sea Grant Hanauma Bay Education Program is an excellent model and example for effective on-site resource education and protection. Through these programs, the marine life is protected and park visitors (whether residents or tourists) are provided guidelines for appropriate behavior in the marine environment. The benefit goes beyond Hanauma, people can apply what they learn every time they enter the ocean. Through their outreach program (every Thursday, excluding holidays,) public presentations are made by university researchers, graduate students, resource conservation managers and renowned marine biologists, among others, for the benefit of community members. Today Hanauma Bay sees an average of 3,000 visitors a day, or around a million visitors a year. The majority are visitors to the Islands. 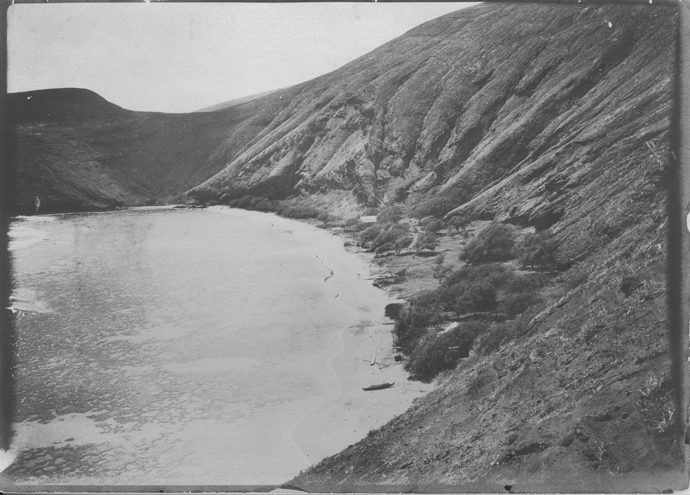 The image shows the early days at Hanauma Bay (Hawaiʻi State Archives.) In addition, I have included other images of the bay in a folder of like name in the Photos section on my Facebook and Google+ pages.